What to Expect - Sports and Spine Physical Therapy, Inc.
We have a premium professional team with diverse experience and interests combined with passion and care. We will create a positive atmosphere from the first time you walk through our doors. You can have confidence in our ability to help you with your rehabilitation program and to get you back to doing the activities you love. You can expect a professional, pristine environment that fosters improving function, fitness and well-being. A patient can expect our staff to treat him/her like we would want our closes relatives to be treated. Once inside the facility, you will be greeted with a warm welcome and a jovial setting which will assist you in reaching all of your rehabilitation goals. least 15 minutes early to complete their paperwork. The patient must bring their ID, insurance card and referral from their physician (if applicable). Our office will make photocopies and return them promptly. Initial evaluations usually are approximately 60 minutes. 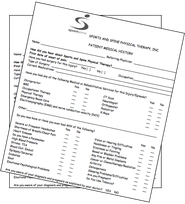 Download patient intake forms by clicking on the image. Click here for a partial list of insurances.